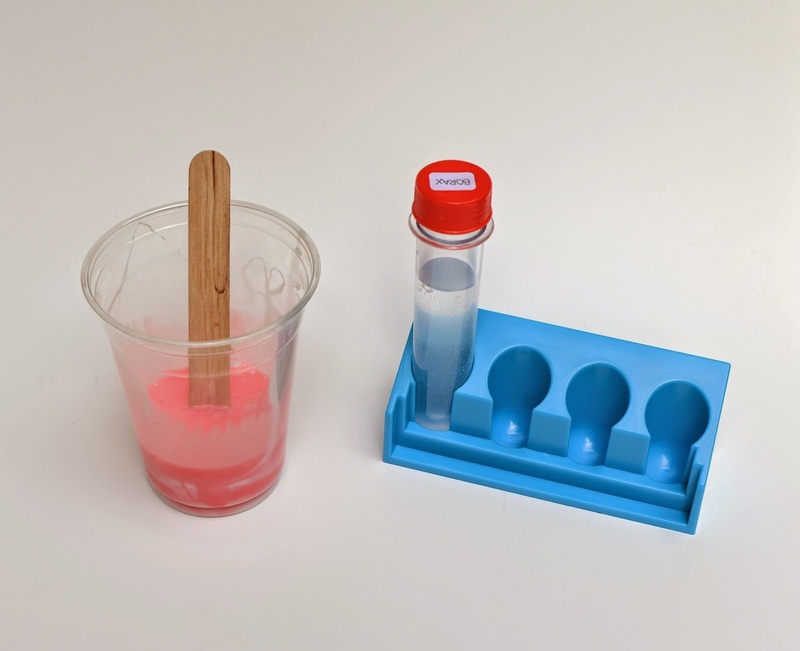 Here begin the posts in which we detail the different experiments from Emily's Science Party. 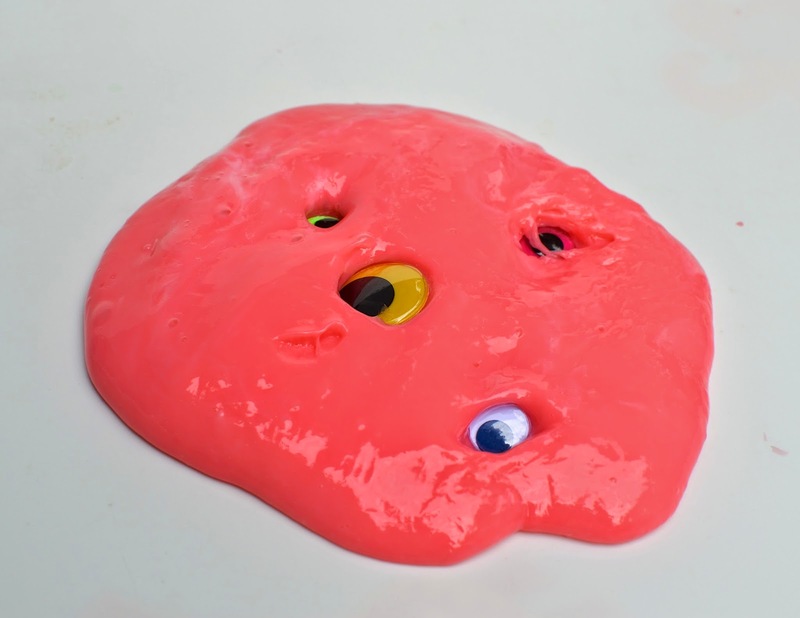 We almost called it a polymer party because so many of them involved some type of semi-solid gelatinous mass of gunk. 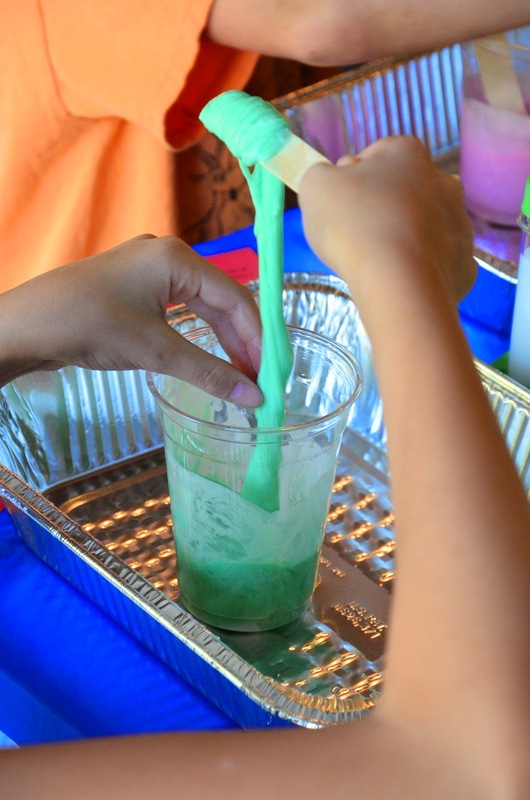 Emily had been scouring the internet all summer for possible recipes for combining slime, and she explained that you can make it from anything from borax to liquid starch to polyvinyl alcohol. I am not crazy about the stained mess that is our kitchen countertops after each of her experiments, but I am happy that she is learning so much about something she likes. Back to her party now. This first slime is what we call Regular Slime. 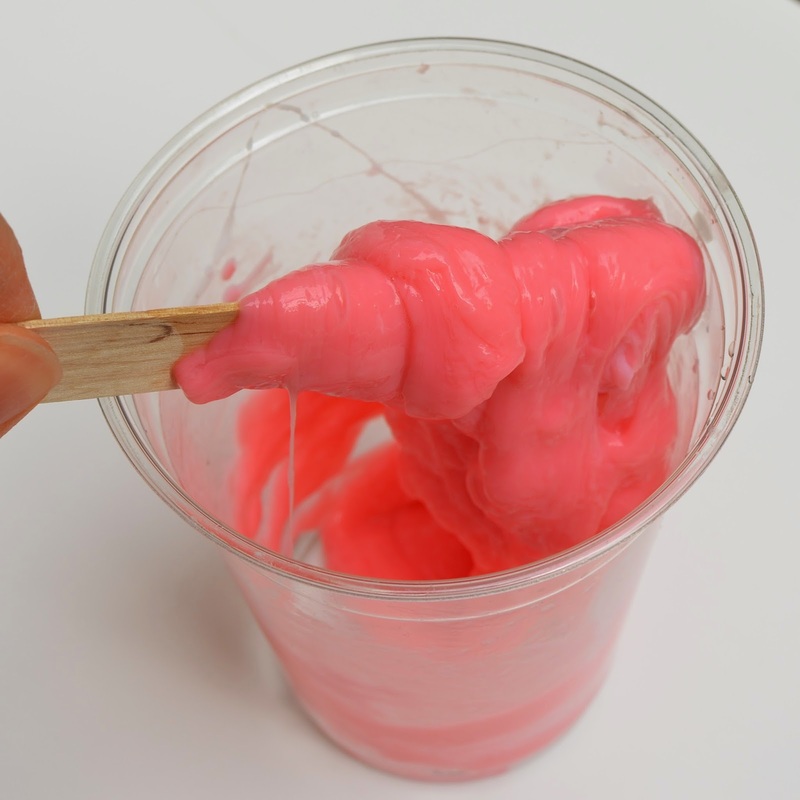 It is probably the simplest kind of slime to make. All you need are borax and glue. 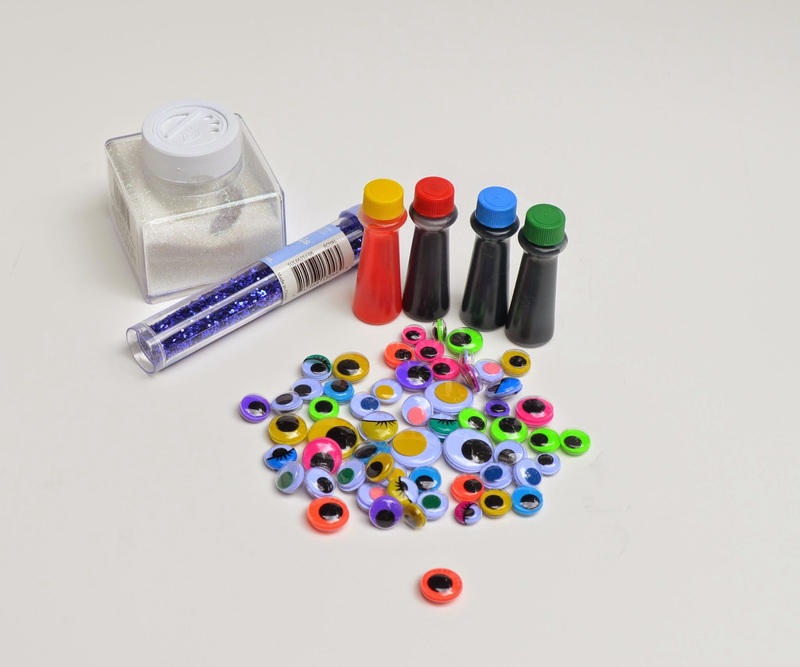 We used white glue but you can use clear glue, or clear glitter glue, too. White glue gives an opaque slime, and clear glue gives a translucent slime. We'll share what that looks like in the next post when we use the clear glue. which Emily glued in pairs back-to-back so they would be like 360-degree eyes. a small quantity of borax dissolved in water to saturation point (we used 1/4 tsp to about 1/4 cup of water). 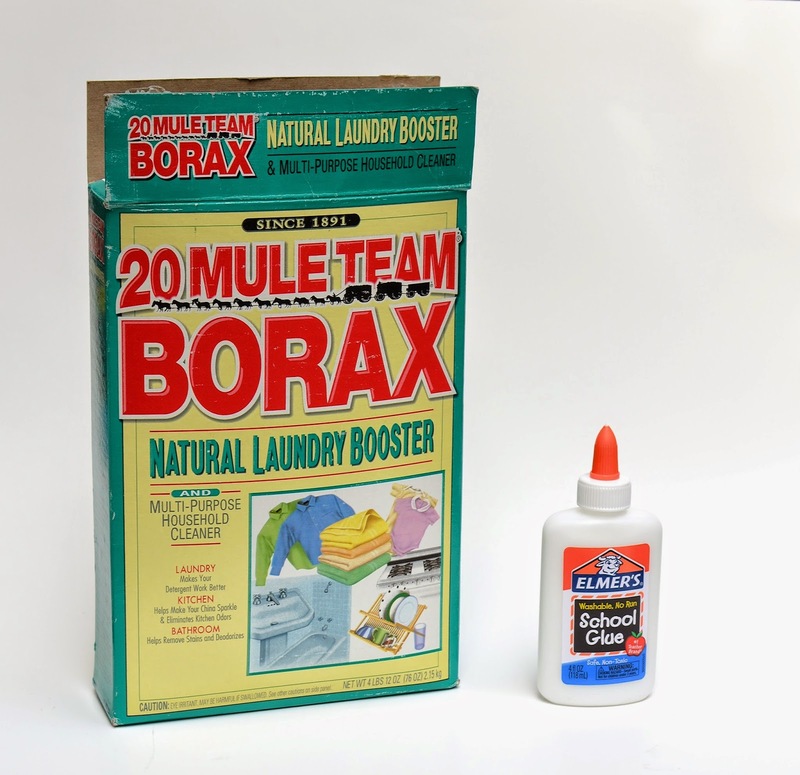 Then mix the borax solution thoroughly to ensure the borax dissolves. There may be a little residue left, which is okay. 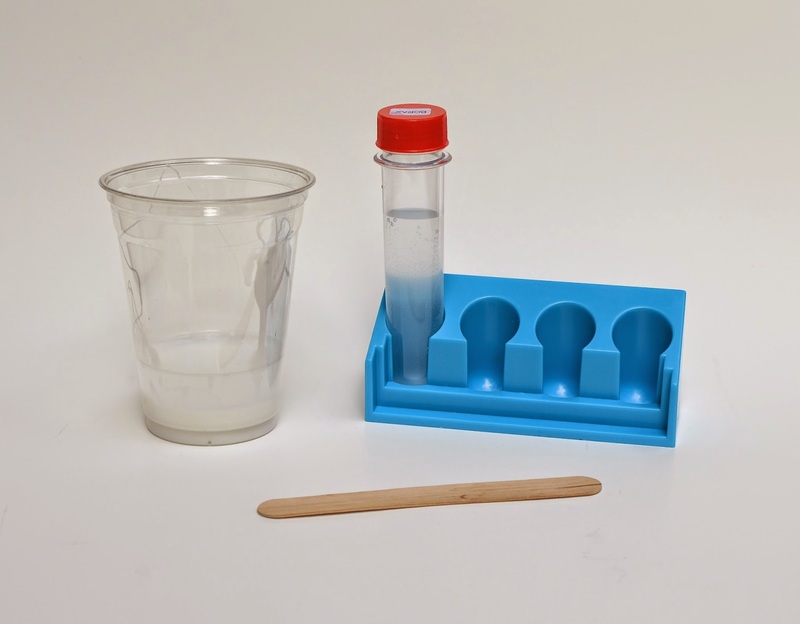 Add, bit by bit, the borax solution to the cup of glue-and-water. 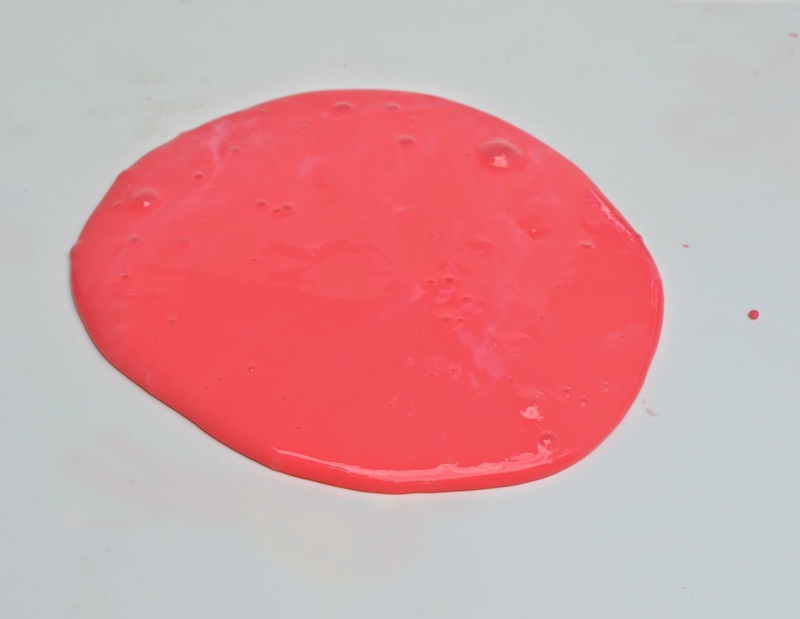 As you stir, solid chunks (the slime) will form, like congealed milk that has overdosed on plastic pills. The chemistry behind this is straightforward: white glue contains polyvinyl acetate, which is a large molecule called a polymer. 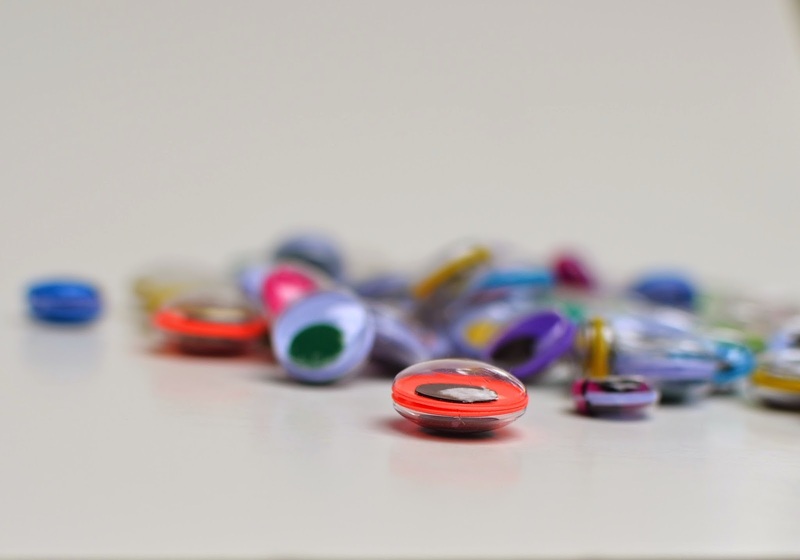 These polymers move over each other relatively easily and smoothly. The borax, when dissolved in solution, forms ions that link those polymer molecules into longer chains. These longer, bulkier chains don't move over each other as easily, which is what we observe as the thick consistency and gunky behavior of slime. Pretty soon, the solid bits will separate en masse from the liquid portion, of which there will eventually be hardly any left. 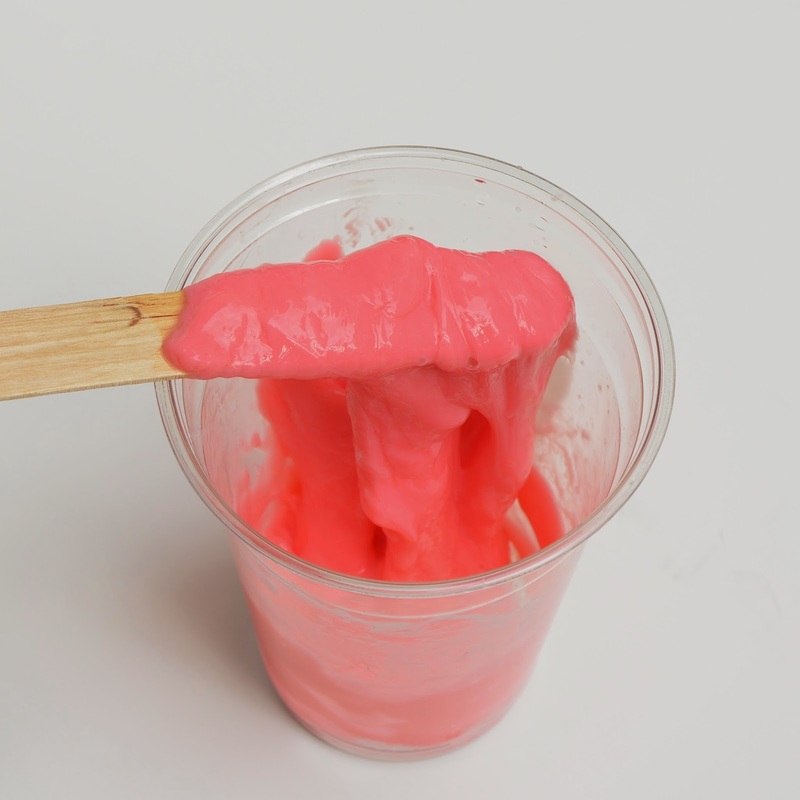 You can stop adding borax at this point and start kneading your slime and playing with it. It will be soft, spready and clammy but will not stick to your hands. 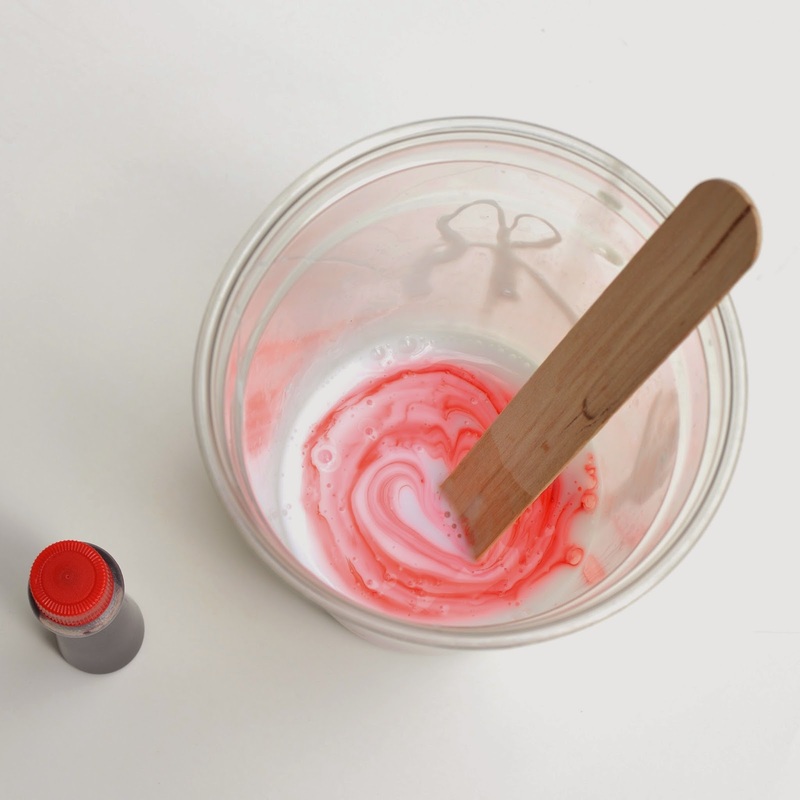 If you continue adding borax, it will eventually become quite hard and plasticky, and can be shaped into a (temporary) ball. At this stage, Regular Slime is complete, and kids are usually enthralled by it as is. 1 You can add googly eyes and turn it into Nightmare Alien slime. 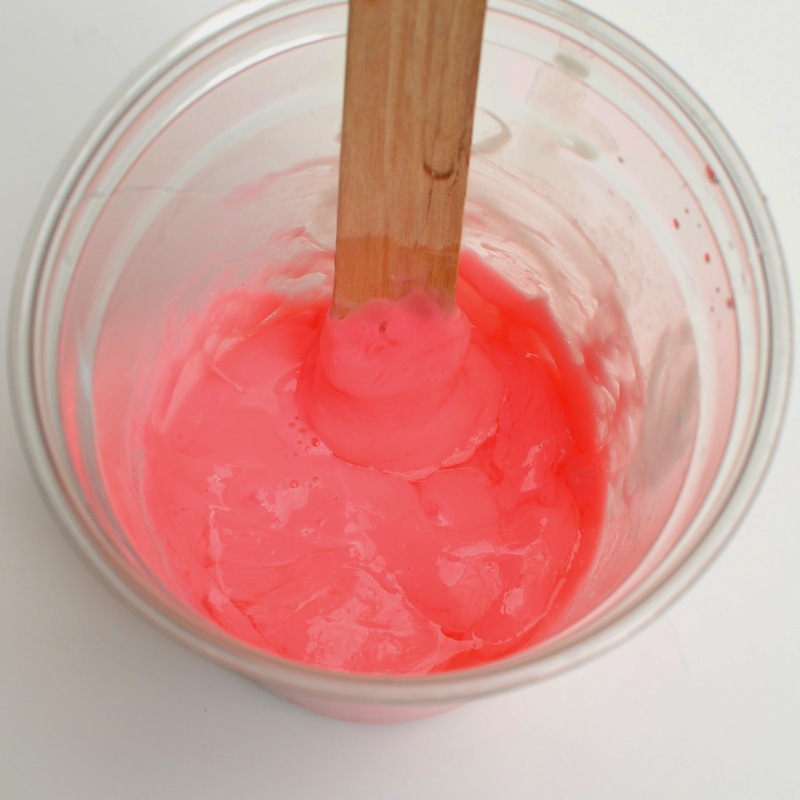 2 You can add glow-in-the-dark paint (best to add it at the food coloring step) to make Halloween slime. 3 You can add cornstarch to turn it into bouncy balls. 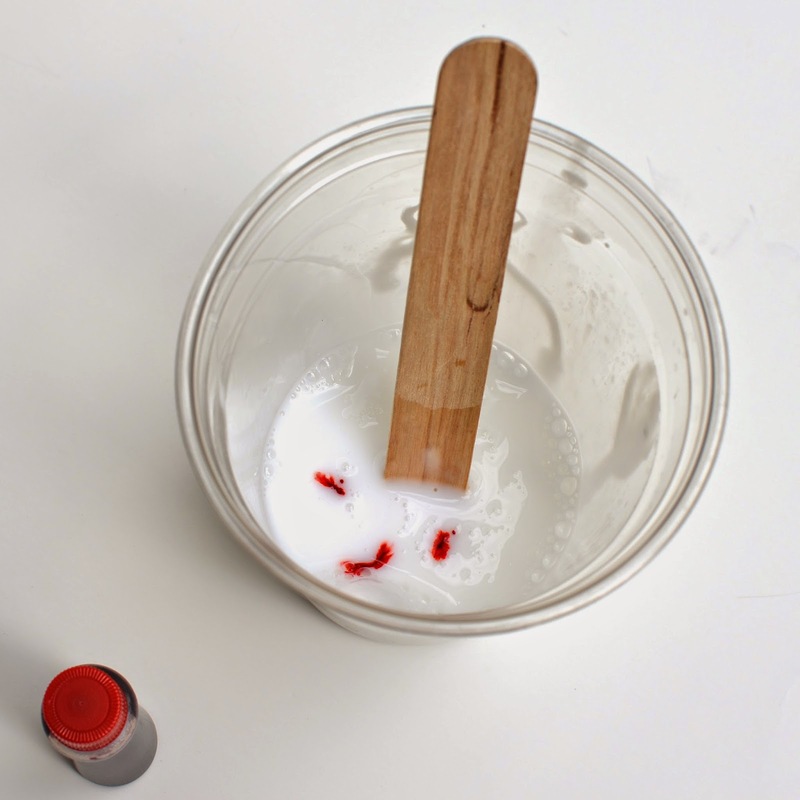 4 You can add iron oxide powder to turn it into magnetic slime (but you need a very strong magnet to get it to work). The only slime I've ever made was with isapgol or psyllium husk, which is so very easy to procure here, but this looks doable too. Thank Emily for scouring the net and distilling its essence! My son made this at camp this summer, and I've been meaning to find the recipe. He loved it, and I couldn't throw out the bag of slime because I loved it too...but now it's no longer slimy (leaving the ziploc bag open for days has that effect). Can't wait to make this, and the bouncy ball version!